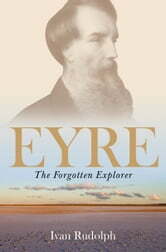 Lake Eyre, the Eyre Peninsula, the Eyre Highway that traverses the Nullarbor between Adelaide to Perth and many other landmarks are named after explorer Edward John Eyre. So why do Australians know so little about this explorer today? Edward John Eyre was one of the most intrepid explorers to tackle the unforgiving Australian outback - and one of the youngest. Lake Eyre, the Eyre Highway between Adelaide and Perth, and many other landmarks are named after him, yet so little is known of his time here. He also had an international career beyond his Australian experiences, including as Lieutenant-Governor of New Zealand. Author Ivan Rudolph shows how this idealistic young Englishman - still in his teens when he arrived in New South Wales in 1833 - transformed himself into a rugged frontiersman, one of the first to overland cattle to Melbourne and Adelaide. But it's Eyre's attempt on the Nullarbor that was the peak of his Australian career. Determined to find an overland route to Perth, he left Adelaide with a small party on 18 June 1840. Ivan Rudolph relates their journey step by step - and it makes for gripping reading. Beset by the harsh terrain, scarcity of water, the danger from hostile Indigenous people and dissent - and worse - among Eyre's companions, could Eyre achieve his ambition and find a way across the Nullarbor? A fascinating portrait of a forgotten hero of Australian history.